Environmental questions are at the heart of many development dilemmas in Southeast Asia. New actors and technologies, changing domestic politics, policies, and economies - as well as shifting geopolitical contexts, are remaking nature-society relations in the region. A failure to address transnational environmental challenges could not only undermine ASEAN’s legitimacy but also have drastic consequences for the region’s security and its political and economic stability. In addressing these questions in this Working Paper, we are particularly concerned with contested knowledges of “the commons” and competition over resources. We consider the environment as a driver of processes of regional integration, but also of conflicts between various actors in the region. Our research focuses on three environmental contexts namely: sea; rivers; and air. In addressing all three our emphasis is on the transition to a low-carbon economy. Grounded in a multidisciplinary approach, our research shares a common conceptual framework, centred on the co-production of ecological knowledge and ecological governance. Drawing on the work of Sheila Jasanoff (2004), Shubhra Gururani and Peter Vandergeest (2014), amongst others, we consider the production, circulation, acquisition and assimilation of ecological knowledge at, and across the local, national and global levels and its relationship to ecological governance. Based on macro and micro case studies, we relate this dynamic process of co-production to other concepts, including reterritorialization; feminist political ecology, hydropolitics, and paradiplomacy (international relations conducted by subnational governments on their own). The aim of this paper is to present the theoretical framework of our work as well as the three main strands of our research. In the first section, we explain our understanding of the concept of ecological knowledge. This is followed by a presentation of our methodological approaches, while the last section presents the individual research projects in the WP, arranged in three modules. Please contact Dr. Carl Middleton for more information. Citation: Kamiński, T., Arnez, M., Middleton, C., Beckenham, S., Farnan, R.A., Chu, D., Roszko, E., Thitibordin, A., Valente, A., and Zaręba, M. (2019) The Environment - Contested Knowledge of the Commons in Southeast Asia (CRISEA Working Paper 1). Competing Regional Integrations in Southeast Asia (CRISEA) Working Paper No. 1 (March 2019). This report is part of our project Water governance and knowledge production on the Lancang-Mekong River. You can visit the project page here. OPINION: What does Chinese ‘reciprocity’ mean for Mekong’s dams? It is now two and a half years since the first Lancang Mekong Cooperation (LMC) leaders’ summit was held in Sanya city on Hainan Island, China. The aim of the LMC – a China led multilateral body involving all six Mekong countries – is to deepen economic, cultural and political ties between China and mainland Southeast Asia. Leaders have repeatedly declared the importance of the Lancang-Mekong River to this cooperation. Reflecting this, on 1-2 November, the LMC will host the “1st Lancang-Mekong Water Resources Cooperation Forum” in Kunming, China. The LMC’s second leaders’ summit in Phnom Penh, Cambodia in January 2018 revealed the swift pace of the initiative. This is reflected in the numerous senior-level meetings between governments, the initiation of almost 200 China-funded projects, and the LMC’s deepening institutionalisation through various LMC secretariats and working groups. Yet, while China has hosted people-to-people exchange programs and university scholarships, the LMC’s state-centric approach has afforded little opportunity for public deliberation about its overall policy principles and direction. Through the LMC, some government officials and scholars from China have proposed that downstream and upstream countries have both rights and responsibilities towards each other. This concept of ‘reciprocity’ is not yet official LMC policy, but suggests a shift in government position compared to China’s earlier unilateral construction of dams on the Lancang River. Overall, the LMC and its proposition of ‘reciprocity’ appears to be an invitation to negotiate basin-wide water cooperation on the Lancang-Mekong River. Much, however, remains uncertain. For example, how will the LMC build upon the existing inter-governmental Mekong River Commission, established in 1995 by the four lower basin countries? How will the LMC address concerns of riverside communities and civil society and ensure their meaningful inclusion? And how will countries ensure the river’s ecological health given the strong push for economic growth and associated water infrastructure projects? This article asks whether the LMC and the concept of ‘reciprocity’ is a promising approach to meet these challenges. Visit the Water governance and knowledge production on the Lancang-Mekong River project page here. It is now two and a half years since the first Lancang Mekong Cooperation (LMC) leaders’ summit was held in Sanya city in Yunnan Province, China. During this period, the LMC has become increasingly institutionalized. The overarching ambition of the LMC is to deepen economic, cultural and political ties between China and mainland Southeast Asia. This policy brief assesses emerging principles for transboundary water cooperation under the LMC, in particular the concept of reciprocity that expands upon the UN Water Courses Convention. It also assesses the role of the LMC vis-a-vis the Mekong River Commission in transboundary water governance. 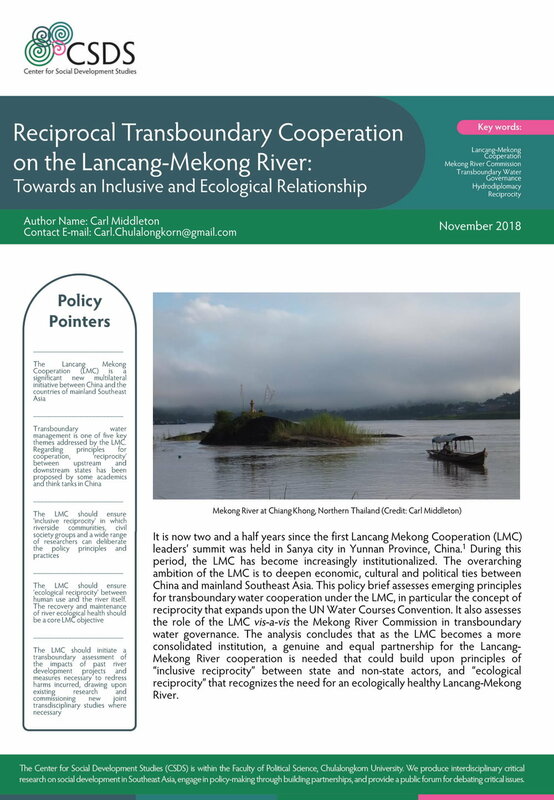 The analysis concludes that as the LMC becomes a more consolidated institution, a genuine and equal partnership for the Lancang-Mekong River cooperation is needed that could build upon principles of “inclusive reciprocity” between state and non-state actors, and “ecological reciprocity” that recognizes the need for an ecologically healthy Lancang-Mekong River. This article examines the role of National Human Rights Institutions (NHRIs) and transnational civil society in pursing Extraterritorial Obligation (ETO) cases in Southeast Asia as a means to investigate human rights threatened by cross-border investment projects. Two large hydropower dams under construction in Laos submitted to NHRIs from Thailand and Malaysia, namely the Xayaburi Dam and Don Sahong Dam, are detailed as case studies. The article argues that the emergence of ETOs in Southeast Asia, and its future potential, is dependent upon the collaborative relationship between the NHRIs and transnational civil society networks. Whilst NHRIs are in positions of political authority to investigate cases, civil society also enable cases through networking, research, and public advocacy. Further institutionalization of ETOs is significant to emerging regional and global agendas on business and human rights, including the UN Guiding Principles on Business and Human Rights that both the Thai and Malaysian governments have expressed commitment to. However, in Thailand and its neighboring countries where investments are located there has been an authoritarian turn. Reflecting this, there are weakening mandates of NHRIs and reduced civil and political freedoms upon which civil society depends that challenges the ability to investigate and pursue cases. For further details on the book please visit the book's website here. In the 1990s, the global hydropower industry – in particular the industry of Northern countries – was facing a growing crisis of legitimacy. Opponents of large dams grew in numbers and became increasingly vocal, claiming that development benefits were exaggerated. This cumulated in the publication of the World Commission on Dams (WCD) report in 2000, which affirmed many of the opponents’ criticisms. In this context, the World Bank, seeking a means to once again finance large hydropower, put forward the Nam Theun 2 (NT2) hydropower project as a new, best-practice approach. Meanwhile, the International Hydropower Association (IHA) sought to counter the WCD with its own sustainability guidelines in 2004 and subsequently a Hydropower Sustainability Assessment Protocol (HSAP) launched in 2011. From this significant and combined effort of large am proponents emerged the policy discourse of “sustainable hydropower,” the purpose of which was to re-legitimize the industry. This chapter deconstructs how NT2 has been discursively produced as a “brand” and woven in to the “sustainable hydropower” discourse. The chapter argues that in public the World Bank and the hydropower industry have regularly drawn on the NT2 as a model to legitimize their claim that “sustainable hydropower” can exist. Needless to say, this claim is fiercely disputed. Indeed, behind closed doors amongst the project’s proponents and in specialist hydropower industry conferences, more provisos and nuances are considered that bracket the public claims of success. The chapter also addresses how NT2 has been represented in regional and global debates on “sustainable hydropower,” for example in relation to the Hydropower Sustainabilty Assessment Protocol led by the International Hydropower Association. Citation: Middleton, C. (2018) "Chapter 13: Branding Dams: Nam Theun 2 and its Role in Producing the Discourse of 'Sustainable Hydropower'" (pp 271-292) in Shoemaker, B. and Robichaud, W. (eds.) 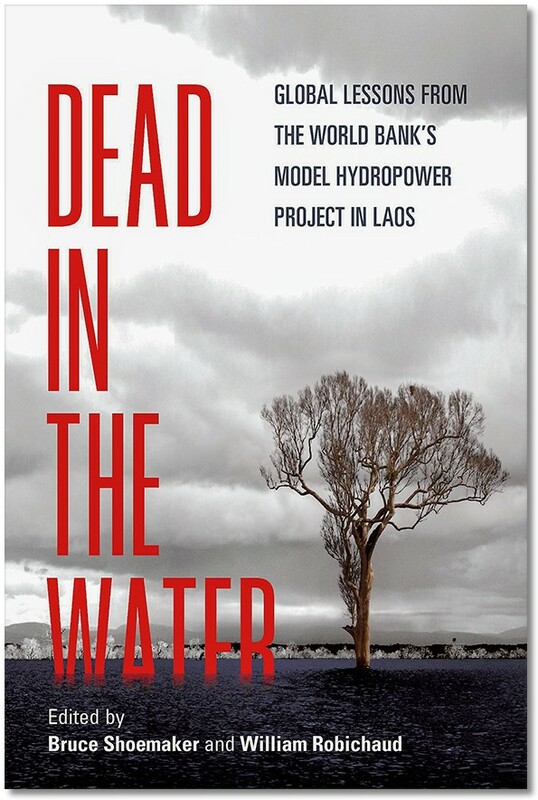 Dead in the Water: Global Lessons from the World Bank's Model Hydropower Project in Laos. University of Wisconsin Press: Madison. Development comes at a cost, but what that cost is and who bears that cost is not set in stone. China’s rapid economic ascent has lifted hundreds of millions out of poverty, but it has also precipitated severe ecological crises. In many cases, a “pollute first, clean up later” mentality towards industrialization has led to inequitable and unjust outcomes for both people and the environment. The Chinese government’s efforts on maintaining high economic growth rates in an effort to modernize the economy and society has in many cases obscured the scale of damage done to the environment, though the Chinese government and other institutional actors are actively taking steps to mitigate and alleviate issues of environmental degradation. The story of the Nu River, also known as the Salween or the Thanlwin, illustrates how hydropower development on the river was actively contested and resisted by diverse stakeholders, opening up possibilities for other kinds of water resource management and development. The 2018 Salween Studies Research Workshop gathered researchers and experts from around the world on 26 & 27 February at the University of Yangon, Myanmar to discuss the present situation of this important river as well as the future of the basin, its people and natural ecologies. This research workshop was also the final meeting of the Salween Water Governance Project and as such, represents the culmination of three years of research and collaboration among the “Salween University Network.” The workshop was co-hosted by the University of Yangon, the York Centre for Asian Research and CSDS, with the kind support of CGIAR WLE and Australian Aid. Over sixty participants were able to spend two full days diving into important issues and developments all related to the unique Salween River, with topics ranging from the traditional conversations around water management and natural conservation to more contentious presentations on peace/conflict and alternative development planning. With great diversity in backgrounds, nationality and expertise, it can be concluded that the wealth of knowledge exchange and learning that took place during this workshop was not only inspiring to all those in attendance, but has set the bar for future gatherings on the topic, aimed at creating real action and planning for Salween River sustainable and inclusive development. The article explores the process behind the construction of the Chao Phraya Dam, the first World Bank-funded water infrastructure project in Thailand, developed during the 1950s. Employing Andrew Pickering's ‘dance of agency’ concept in examining the process of turning financial and technical assistance into a workable project, I argue that development infrastructure, like the Chao Phraya Dam, provides a space to explore the dialectic operations – accommodation and resistance – of agency and the unstable associations among diverse actors, expertise, institutions, and materials, as well as practices. Recounting the history of the dam in the making, I explore a series of entanglements through different dances of agency, namely initiation, assessment, mobilisation, negotiation, adjustment, confrontation, and settlement. Such a multiplicity of dances inside and in the making of infrastructure reflects the techno-political entanglement encompassing the manifold negotiation and adjustment of conflicting goals, interests, recognition, and cooperation among different agencies. The dam, often portrayed as an engineering achievement of the state, is in fact the result of unanticipated relations and the responses to the temporal emerging forms of practices. This policy brief aims to highlight and analyze the impact of land cover changes to the socio-economic conditions of four villages in Bawlakhe District, Kayah State and its policy implications in Myanmar. The study area lies in the Thanlwin (Salween) River Basin, home to communities of various ethnic groups including the Kayah, Yintale and Shan, as well as being rich in biodiversity. These local communities heavily depend on this watershed area for most parts of their lives, including food, water, security, fuel and income. The main economy of the people in these areas depends on forest production, which is the major economy in Bawlakhe. Moreover, local people depend on subsistence farming, especially shifting cultivation which is practiced in these areas. Their livelihoods are still closely related to the environment and largely contribute to the local economy. This policy brief shares geographical research to describe the role of forest use in support of livelihoods for the communities in the study area.Declining fish stock and catches within the estuary and out at sea have had deep impacts on community livelihoods, ecology and socio-economics within last ten to forty years. Encouraging the reduction and management of the natural and anthropogenic threats might encourage specific ways to improve the fishery status of the estuary. The Thanlwin/Salween River originates in China, where it is known as the Nu (angry) River and flows south into Myanmar, then eventually Thailand. It meets with two rivers (namely the Gyine and Attran Rivers) at the point of Mawlamyine and together discharge into the sea (Gulf of Mottama) by two channels (namely the Mawlamyine and Dayebauk Rivers). These four Thanlwin tributaries are experiencing daily tidal intrusion and freshwater discharge, forming estuarine environments and habitats for varieties of fresh, brackish and marine creatures. The term estuary refers to a mixing body of fresh and sea waters. The Mon and Kayin ethnic groups are dominant around the estuary and the riparian communities largely depend on fisheries within the river tributaries as well as those out at sea for their livelihoods and survival. Declining fish stock and catches within the estuary and out at sea have had deep impacts on community livelihoods, ecology and socio-economics within last ten to forty years. Encouraging the reduction and management of the natural and anthropogenic threats might encourage specific ways to improve the fishery status of the estuary. Kun Lone township, situated in Lashio District, Northern Shan State, Myanmar is home to various ethnic groups, namely the Kokant, Wa, Kachin, Larr hue, Bamar, and Shan. It is also home to various medicinal plants that are essential for traditional medicine practices. In developing countries, traditional medicine is perceived to be an important part of human health care (WHO, 2002). In Myanmar, health care has even been provided to the people with potent therapies of traditional medicines at Yangon Traditional Medicine Hospital, Mandalay traditional medicine hospital and Monywa Traditional Medicine hospital. Myanmar traditional medicine practitioners aim to give health care services to people in accordance with their traditions. This policy brief documents traditional ethnomedicine use and practices in Kun Lone township and suggests ways that traditional medicine can continue to provide health care benefits for the future. Hakha town is the capital of Chin State, Myanmar, located in the mountainous Northwest of the country. In recent years, the town’s population has faced growing water insecurity, which has created great hardship for the local population. Meanwhile, a major landslide in the town in July 2015 compounded these challenges, resulting in the resettlement of over 4000 people. The purpose of the research presented in this report is to understand the underlying factors and dynamics that have produced water insecurity in Hakha town to generate policy recommendations towards attaining sustainable access to water for all.